We sit with our feet propped up on the seat of Joe Baska’s 16-foot aluminum boat, watching a quartet of lines hanging tight in an eddy swirl of the Susquehanna River. The modified-V is anchored in 5 feet of water, tethered by the bow. Every so often the anchor rope slackens in the shifting currents. We’re dressed in long pants, sweaters and windbreakers, and there are two thermoses of hot coffee on board. A lot of other guys have given up for the year, but Baska takes his carp fishing seriously and has done so for more than 30 years. Baska enjoys having the water to himself but says the real draw is being able to fish a number of good places that he might not in the warmer months when always-cautious carp are being spooked by other boaters. “I love this season for carp,” he says. While other anglers may like to cast aggressively for their fish, Baska is content with unhurried presentations that let wide-bodied carp find the bait in cool river water.There is nothing laid back about the way he responds after a carp finds that bait, however. Through a sensitive rod and line, he intently follows everything the fish does. I notice a slight hop in one of these lines, and when the line hops again, Baska nods. He told me earlier the big Shimano 8000 D bait-runner spinning reel was set light to allow a fish to swim away with the bait. But it still takes a full 30 seconds for the hopping in the line to change into a slow sputtering pull. Baska now has his hands wrapped around the rod and reel, slowly lifting the rod tip up to fighting position. A powerful tug-of-war commences with the fish quickly winning more than 30 yards of line. I reel in the other lines as the carp works downstream into the eddy, and when the fish decides to go even farther into the next run, Baska throws out the anchor line, which has a large rubber buoy clipped to it, and tells me to start the motor. “We’re going for a ride,” he announces gleefully. When we slide into a deeper pool, the carp hunkers down. I keep the boat off to one side so Baska can walk back and forth along the starboard side fighting the fish. More line peels back off the spool, but the fish stays in the pool. When it swims behind the stern, I push the boat forward so there’s space between the line and the motor. “That’s great,” Baska says, and I’m feeling good about my captaincy until the bow bumps a submerged rock and both of us are thrown off balance. But that’s just a risk of boating the rocky Susquehanna. By this time, the carp is churning near the surface, and I drop the throttle in neutral, grab the big basket net, and slide its wide hoop under the fish. Baska puts down his rod and uses both hands to lift net and fish into the boat. Twenty pounds sold this fish short. Add four or five for a better picture. “Did it hit the corn?” I ask. Baska says fall is not the season for super long casting rods or sensitive floats. Because of this, Baska likes to locate a school of carp and then drop the bait right in front of them. He says he’s sight-fishing, in a way, but only so far as finding an area where carp are working as opposed to expecting the carp to come find the bait. “You always need the right habitat spring, summer or fall. But when the water turns cooler, they’ll limit their travels and remain in the best places, at least in the river,” he adds. Carp tend to hold in slower water, but that doesn’t mean you want to fish the slowest sections of the river. While Baska may present bait on the bottom in slack water, it’s always close to current. Carp are line shy, and it’s not just the sight of the line you have to be worried about, it’s also the feel. “If carp feel something rub across their bodies, something they’re not used to like a tight line, the emergency signal goes up, and they high-tail it out of there. When everything else is quiet and calm and carp suddenly spook, it’s often because they’ve rubbed against the line. Baska likes 50-pound-test braided line for the strength, sensitivity and lack of stretch. He also likes that braided line has less diameter than comparable mono and so isn’t as affected by current. Because braided line can be conspicuous, a barrel swivel connects a 5-foot leader of 17-pound-test fluorocarbon to Baska’s line. A pegged pencil weight sits next to the swivel 5 feet from the bait. A hook in size 1/0 to 3/0 carries the lightly squeezed kernel-corn bait. Baska keeps the drag tight but the reel’s anti-reverse turned off, so the reel handle can be turned backwards. 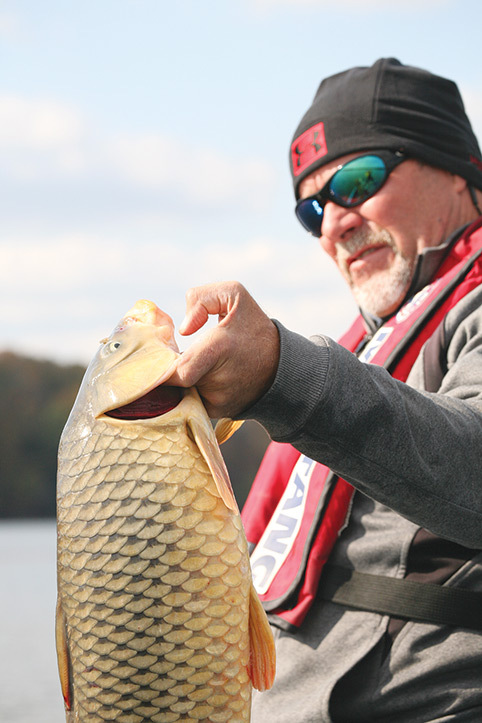 “When a carp rushes away from the boat, maybe the drag won’t kick in quickly. But with the anti-reverse off, I can back-reel that baby quicker than anything. Baska catches three big river carp this day, turning the anti-reverse back on during the long-distance part of each battle. But whenever the carp are back within netting distance of the boat, he flips it off to handle the late surges. It only makes sense that back-reeling is most beneficial when a big fish is close to the boat, especially on a line with very little stretch. But it all seems instinctual, not calculated, with Baska. Back-reeling a powerful fish is like downshifting a hot rod to stay in control, and like driving a muscle car, catching big carp is all about feeling that power and then handling it. “They store tremendous energy in their big bodies and can turn that into enormous bursts of speed and power,” Baska says.